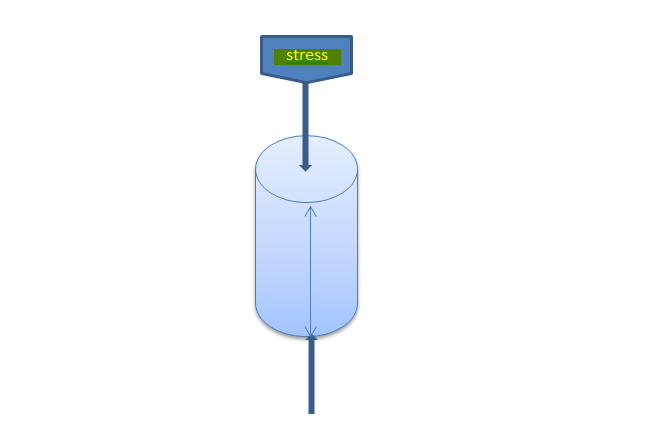 Stress is defined as; ” force per unit area.” Stress is the combination of loads like dead loads, live loads, wind loads that will acts on the structure during construction and during service life. Strength of concrete is the measure of total stress that it is able to bear before failure. Stress and strength are directly relates to each other in a sense that when amount of stress before failure increases then this mean material has high strength as compared to material that has low stress value before failure. Stress is inversely proportional to per unit area of concrete. When per unit area of concrete increases than in the same proportion amount of stress that material is able to bear before failure also decreases. In short material strength decreases. Example to this case is very simple, as if per unit area of concrete increases then weak points in the concrete increases. Weak points are that point through which material fails or from where cracks propagate in concrete any type of paved surfaces. When this case happens then concrete structure will fail after the application of stress smaller than the design one.